“In the museum at Cairo, No. 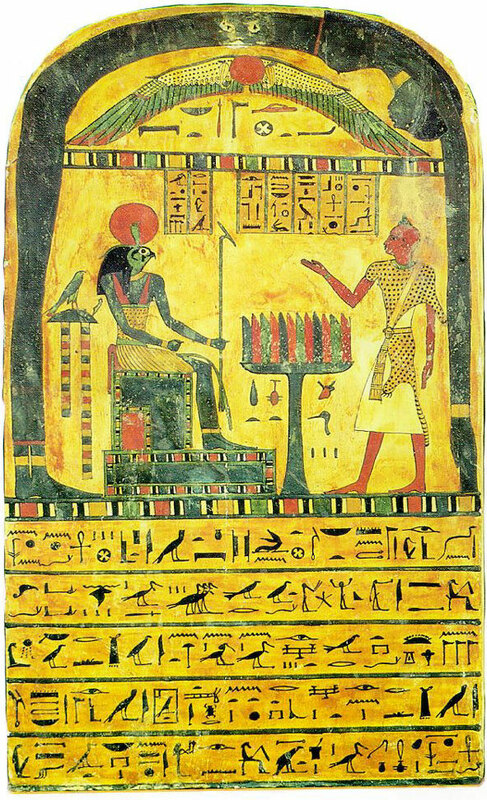 666 is the stele of the Priest Ankh-f-n- khonsu. Horus has a red Disk and green Uraeus. His face is green, his skin indigo. His necklace, anklets, and bracelets are gold. His nemyss nearly black from blue. His tunic is the Leopard’s skin, and his apron green and gold. Green is the wand of double Power; his r.h. is empty. His throne is indigo the gnomon, red the square. 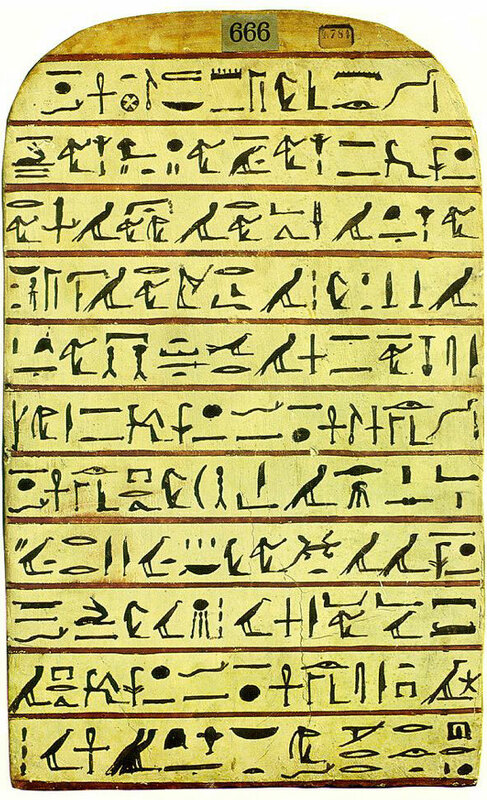 A translation of the Stèle text, by Dr. Alan Gardiner and Battiscombe Gunn. Topmost Register (under Winged Disk). Behdet (? Hadit ? ), the Great God, the Lord of Heaven. Ra-Harakhti, Master of the Gods. Osiris, the Priest of Montu, Lord of Thebes, Opener of the doors of Nut in Karnak, Ankh-f-na-Khonsu, the Justified. Oxen, Geese, Wine, (?) Bread. Behind the god is the hieroglyph of Amenti. Osiris, the Priest of Montu, Lord of Thebes, (5) Ankh-f-na-Khonsu, the Justified; son of MNBSNMT (The father's name. The method of spelling shows that he was a foreigner. There is no clue to the vocalisation); born of the Sistrum-bearer of Amon, the Lady Atne-sher. 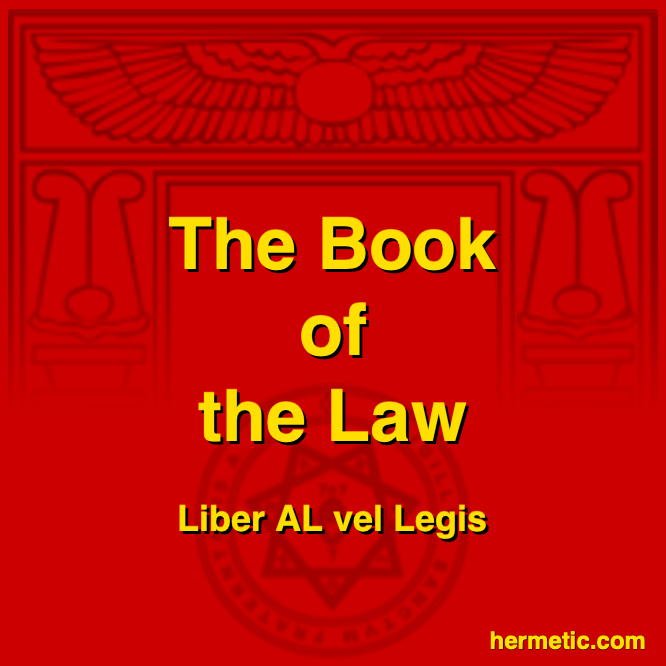 Parts of this poetic version also appear in Liber NU, Liber Resh vel Helios, in the text of Liber AL vel Legis and many more. 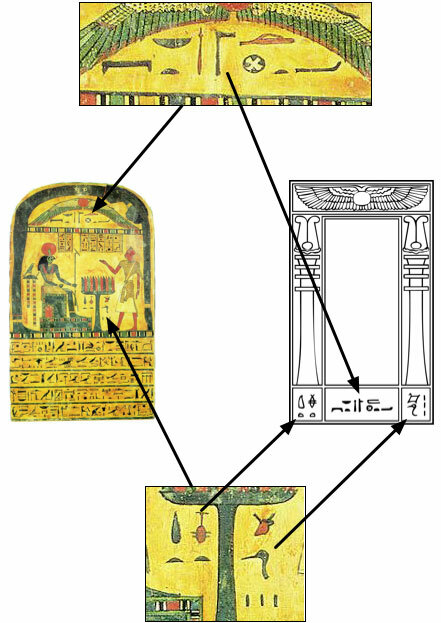 If you’ve wondered what the hieroglyphics at the bottom of the portal graphic used for all of Crowley’s libers are, then you can find out by examining the Stèle. From Gardiner’s translation these are the sections “Behdet (? Hadit ? ), the Great God, the Lord of Heaven” and “Oxen, Geese, Wine, (?) Bread”. Essentially, the language suggests “Meat”, “Drink” and “Hadit”. In some images of the Stèle, there is what appears to be damage at the top of the front, probably from a label, which has been repaired in other images.